Into The Winter, We Tread Lightly. 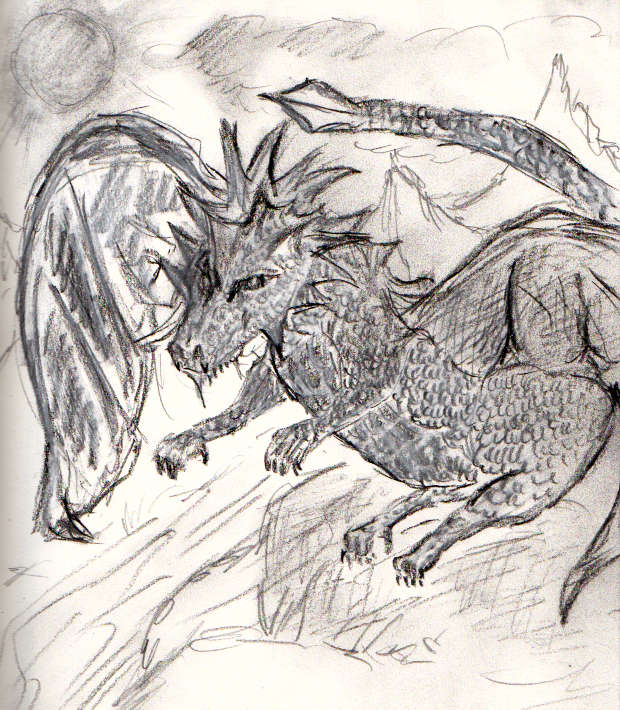 One of my first attempts to use Charcoal Pencils to draw with. Yes I know technically Winter doesn't actually start until December 21st but the frost has already hit NYC. Actually it is a little late this year. But better late than never I guess. Meantime it is dark and gloomy at 3pm and threatens to only worsen over the next few months. And my Doctor called with good and bad news. Good news the liver panel that alerted her a few months ago turned out to not be Liver related after all but I am seriously Vitamin D deficient. Wow well I guess I really did turn into the vampire I often joke about because I never get out during the day. Thanks to my Dad I am expecting Vitamin D supplements soon via snail mail. Meanwhile, I hunker down to play games, write, play music, draw, etc. And in this dreary, depressing time it is hard to stay cheerful. I have found myself uttering grim and loathsome words to good friends. I have found myself loathing life and just waiting on the next day with little anticipation or joy. However, as someone recently posted on Facebook: Keep it positive. Keep it real, but keep it positive. There is no point in endless grumblings and dark thoughts that lead nowhere good. And that also means stop whining about things you have no power over. Like the fact that V4 isn't my favorite piece of software ever. Yeah I know some people have gotten much more dirty and down on it but I have had my share of complaints and to be honest I am sick of it. I just want stuff to be better. But wanting and wishing are not doing. "But I am seriously pulling my grays out by the roots!!" Yeah I actually said that in Chat support channel today. The reason? I accidentally triggered the bug Pete talked about a while back where your account gets a new DCI number. What did I do? I went on to MTGO and railed at the ORCs until someone (Ryath I think) posted the link to the Customer Service number. Which I called. And as an aside I don't know what that "music" is that they play while they are waiting to pick up your call but it is absolutely horrible. But strangely not the usual muzak that such phone contrivances usually play. I am guessing it was some sort of trash electronic music. But I said I would try to avoid complaining and I meant it. That was the downside to calling. The upside is that after 40mins and talking to Louie, we worked out what happened, and how to fix it. Eventually I was able to successfully combine my old DCI # with my old Wizards forums account and I think that also takes care of the bug reports account and the other accounts. If this happens to you, do what I did. Don't panic. Do call customer service. (#1 (800) 324-6496 1 (800) 324-6496). You will not regret it. Also as AJ reminded me: Try not to shout. These people are super polite and nice and don't have anything to do with the stress you are under and they will help you. So don't take it out on them. Also relax. It is super annoying and scary to have the site that controls your history with game not behave nicely but it is not the end of the world. You will go on and things will get better. Even if stuff happens in between that makes you think otherwise. Leagues the eternal joke or the next great thing? And speaking of getting better, Chris K, has recently published a new blog telling us why Leagues are not coming to MTGO in 2014. No wait, he promises it's a good thing. Well I'll believe it when I see it but I do hope what he posts is on the level. It would very good indeed if Leagues come back in such a fashion. I can definitely imagine finagling money to join them if they are as good as he makes it sound. I know, we are past #gamergate already. And who cares what a bunch of angsty, perhaps moldy even, possibly misogynists from 4chan, reddit and the like think? Unless you happen to be one and then you might care how others are making you look. It is so uncool to be a douche that even douches hate the term. By the way the correct definition of Douche is "Useless Sexist Tool" and as far as I am concerned, in re: #Gamergate #crackgate #finkelgate and the like? Don't be one. Work it out, grow up a little, be a man (or woman, anything in between) in the sense of owning your own problems and not borrowing others and remember that every other being in this world shares the boat you are in. I know there is a contingent of you out there who just want all this to disappear and for people to stop worrying about how other people behave. Me too. But here we are with stuff in our faces like yesterdays actual news isn't enough tension in our lives. So to reduce said tension, don't add to it. Smile and put on a brave face and go about your business without harming others. Well that's my plan. Doing no harm isn't a great achievement or famous contribution but it makes me feel good at the end of the day. Meanwhile a small shout out to one of my favorite heroines of the week, month, year: Felicia Day. I find her humor and ability to shrug off malice and depressing subjects to be refreshing and I've come to enjoy watching her stream on occasion on my least favorite streaming site: Twitch.tv. Yes I dislike them a lot but if the stream is fun to watch, I'll put up with the nasty advertisements schemes. Watching her and Ryon (her brother) play various is good fun only sometimes I want to shake my screen and shout "No! No! Don't touch that!' or "The Other Left! Gah!" First, a word about the deck lists' formatting I am using in this article. Francis Law (Frankie)'s last article had images he hand-crafted, to replace the traditional deck lists we've all been generating from Jam's site for years. The only issues I had with this innovation is that the lists are too small to view properly and they don't link to MTGOtraders.com. There are reasons why a writer might turn to new alternatives for deck lists. And Frankie's idea was pretty cool. But I had no intention of doing precisely what he did: Taking snapshots of MTGO deck lists and cutting out the extraneous parts to create a free floating graphic. Way too much work and not much fun either. You see, while Jam's site works fine most of the time, when new sets are out it takes Jamuraa time to get the new sets working. Meantime the deck lists generate with lots of errors to fix and to be honest no one wants to spend hours tweaking html to get stuff to work properly. I have done it in the past it because I am crazy and have the time. So I started creating an alternative deck list generator (using JS and HTML and kept the code pretty simple I think) basically mimicking what Jam's site does but using Gatherer.Wizards.com. This is not ideal because I really want to send you readers to MTGOtraders.com to buy your cards. And if I can make it easier by having links lead there all the better. But when adding links by hand is painstaking and slow and time is of great value it is better to have something that looks presentable and readable without the linking. Well that's my thinking anyway. The deck list generator I made isn't meant to replace Jam's site for everyone. Though I plan to use it more or less exclusively from now on. Now if I could figure out how to use MTGOtrader's api I could link to them instead and all would be awesome and we would not need to bother Jam again. But then I thought, what if I could take Frankie's innovation and apply the concept to the generator I have been making. Presenting the cards themselves seems like a novel way to show a deck list and thus I found the way to do this programmatically without needing endless screenshots. The end result is this page. Feel free to use it as you like. 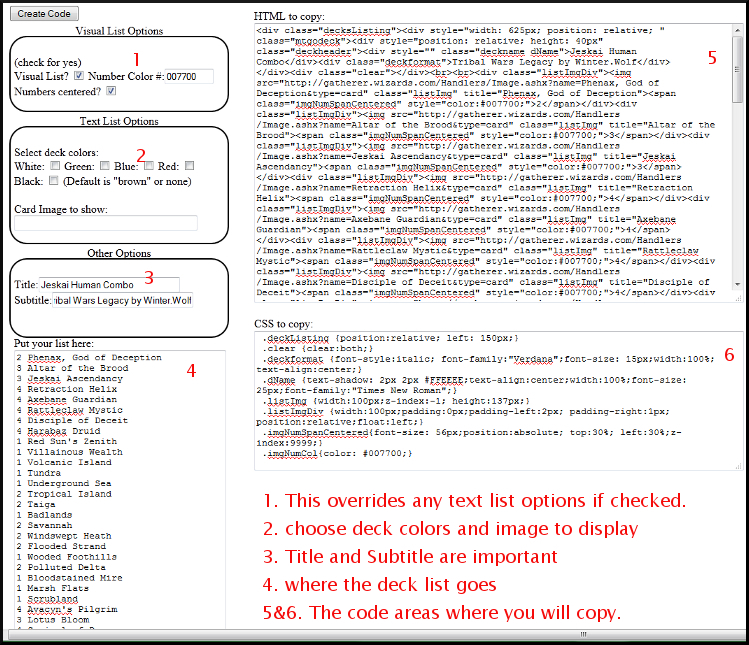 Be warned it requires a fairly strict format of deck list in the text area exactly as MTGO outputs it. If you mess with it, take care as the results may be ugly indeed. To use it, first decide which type of list you want: Visual (as displayed here in this article) or Textual (as in the way Jam's site does it). Then add your list to the text area, toggle what check boxes are needed, fill in the title and subtitle parts, and click the "Create Code" button. This will do several things. It will show you how the deck list will look and it will output code into two boxes. The html box is straight forward. Just put the entirety of its contents into the source of the Article text editor and save. The CSS is only slightly more complicated. In the source (I recommend you do it at the top of the page), you will need an open &lt;style&gt; tag and a close &lt;/style&gt; tag. In between these two tags paste what is in the contents of the CSS box. Unlike adding more deck lists, you will typically only need to that once. What you aren't seeing because there wasn't enough space to screen cap the whole page is the display of how the example looks. But since you are seeing how they look in this article you won't need that here. To be clear I am grateful to Jamuraa for his work over the years providing infrastructure for us authors on puremtgo.com to use but he's become busy and progress waits for no one. As many of you may know I am an aficionado of the format Tribal Wars be it Classic, Vintage, Legacy or what-have you. The thing is the event Tribal Apocalypse run by the ever-enduring Kumagoro is at 5pm GMT. Which is either 1pm or 12pm Eastern time, which is the relevant time zone for me. Heck if I am up before 12pm it is an unusual day to begin with. And I don't operate that well right off Zzzs and so my attendance at the PRE is terrible to say the least. And then I often just mize a deck last minute and it turns out pretty badly for me, giving my happy opponents a bye for the round they face me, and then I drop from the event (on gatherling.com) muttering bitter imprecations and swearing off MTG for about an hour. Well, a few Saturdays ago I was actually awake at a reasonable time and had a deck I'd "tested" with AJ a few times. And by tested I mean he beat me senseless with his deck of the day. And invariably as seems to happen every time I play in this Player Run Event, I faced friends. As the name implies I considered this a bad deck full of jank insects but regardless I rolled over AJ_Impy in 3 games. Game 1 I got the dream ending of getting him coming and going with both Purphoros, god of the forge and then Blasphemous Act into Blood Artist with lots of triggers. The Hellriders were good as predicted by AJ for making my Blood Artists deal damage while they still lived. And Saber Ants with Darksteel Plate were insanely good both as blockers and token generators. Next up was my buddy Fliebana who had no good answers for my incremental damage. Then I was beat upon by the redoubtable MisterMojoRising who nearly won the whole thing with his own version of insects. I feel less bad about that now, though he was playing ":Cheaty Face Living End/Restore Balance CascadeTM" as his engine with a bunch of cycling insects. I may have muttered a few imprecations about that but mainly because I think it is high time the combo see the ban hammer for a few weeks. But then again if we start banning every combo, as Kuma says, there lies madness. And I am generally not a fan of banning stuff because of slippery slopes and well intentioned paths to perdition and all that jazz. Sigh. Well it was fun, and I didn't expect to play so I didn't have a lot of nerves built up in anticipation. Which I find is a difficulty with playing in tourneys. Even when you have nothing on the line. A Friday Night Magic out on the town. 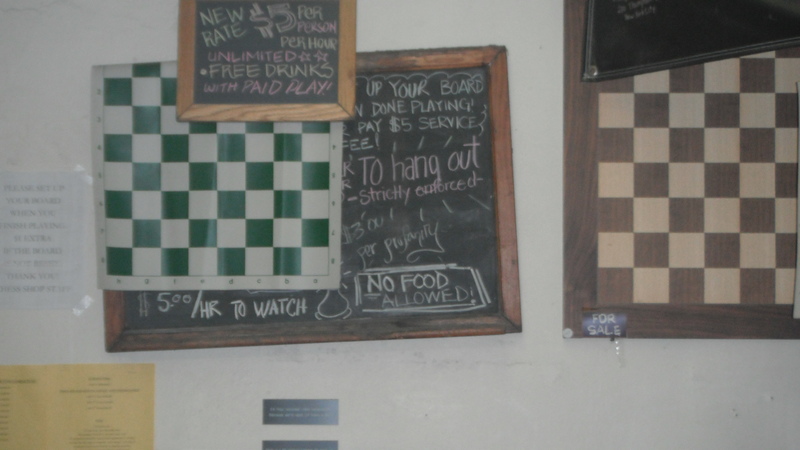 A wall in the Village Chess Shop before it became the Uncommons. Unexpectedly, a good friend messaged me last Friday afternoon, to see if I wanted to play this new game by the guy who wrote the original Shadowrun, was part of the team who did the Shadowrun Returns game (Hare Brained Schemes) and who at some point distant also was involved in HeroClix. The new game Golem Arcana, has figures that you use to create armies and fight each other. BUT wait! There is more. The figures each have stats on them that are readable by a special Bluetooth LE pointer device. (Low Energy is a new technology as I understand it but I digress.) And there is more still. The stylus would be useless without an app to use that data. And that app (which only runs on certain phones btw) creates a profile for each player and after some rigmarole you get to build armies on the app to represent each side and then have at it? I started out in Temur because of Ashcloud Phoenix, had lots of bears and treasure cruises and thought it was fairly solid but then I splashed for Throttle x3 and a foil Murderous Cut. I think adding in 2 extra gain lands + a swamp was clearly a bad idea now, though I did get to cast throttle and cut a few games. It was never a comfortable splash. Additionally I was already pretty stressed from a hard day and while up for gaming not my sharpest so I started the first round (I think we started playing at 9:45pm) by picking up my Sideboard cards shuffling them (including tokens) and presenting that to my opponent who shuffled and sent them back to me. And of course without any land I mulled to 5 before realizing what I had done. This is the reason you sleeve up kids. And don't dream and drive. With a Rel of near 0 I just went ahead and grabbed the right deck, shuffled and drew into a losing hand. It all went downhill from there. Let's just say I went 0-3 and did abysmally though I might have pushed my Planeswalker level over the limit to 28. But my friend had a gas. To be truthful I enjoyed the company and the atmosphere and while I had no business playing Magic until 1:30am after a long full day (including heavy loads of Laundry dragged blocks away and back) it was fun for me too. Later we met up with my friend's newest GF and socialized until we staggered our separate ways to our homes. Not bad for an old guy who hasn't touched a drop of Alcohol or mind-altering drugs in 31 years. Almost felt like old times. :p Since my friend paid he got to keep the cards so I have no list (thankfully) of that debacle to show you. At some point I plan to get into playing Tribal Wars more often and so I keep my hand in the brewing of possible decks and thus have lists to share with you such as the crazy one below. This was inspired by the Jeskai combo craze in Standard and Modern. I thought to myself: "why not try this in Tribal Wars. However, selecting the tribe was a headache because humans aren't really the tribe I want to try new ideas with. But nothing else had the mana dorks needed to work the combo which is basically: 1. Get 2 mana guys in play. 2. Get Jeskai Ascendancy in play. 3. get an Altar of the Brood (or Springleaf Drum) in play. 4. Play Retraction Helix. 5. ??? 6. Profit. There are 2 x spells to profit off of. Villainous Wealth simply decks your opponent, Red Sun's Zenith burns them out. You can also swing for lethal assuming you can get through the red zone. These two cards inspired a few decks when I finally got around to acquiring them. See the Unwritten is both a cool bring stuff into play card and a self-mill for 6 or 7 cards. (6 if you already have a 4 power guy in play and want 2 creatures from the revealed cards) That 6 or 7 cards is enough to empower a Dig Through Time which helps set up the next See. As others have said, Delve as a keyword requires judicious and conscious calculation with regards to mana management. 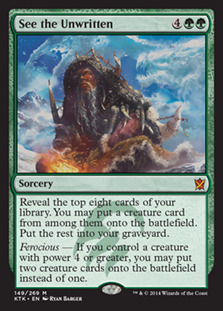 You ideally want to use up any excess mana you have before using up the finite resource that is your graveyard. And in this deck there is tension too, between the various reanimator cards. Whip of Erebos helps mainly by giving your guys Lifelink but it also exists to bring stuff in for a quick bash and exile as needed. Rescue is usually castable if you have anything out at all though ideally you want two guys with Enters the Battlefield tricks as that will get you more bang for your buck. The oddities in this deck are the one offs. Sidisi could easily be in her own deck and I have heard rumors to support the idea that people have already built strong Sidisi decks. She is in here mainly to reinforce the idea of self mill and as a nice token generating midrange creature. If you wanted to strengthen the Siege Rhino you might take her and Clever Impersonator out. I like the new Clone as it is very possible to clone anything your opponent plays but it is likely to be another siege rhino or Ashen Rider. Bow of Nylea gives you a way to return vital cards to your deck and also gives your tramplers deathtouch which is hard for opponents to deal with. At the same time it isn't cluttering up the deck with multiples because while you can deal with extras by using them one after the other you don't need a lot of dead cards in hand. Fated Return is your ace in the hole if you end up needing a guy who doesn't die. Particularly useful against removal heavy/creature light decks. Murderous Cut could also be Silence the Believers, or Utter End. Hero's Downfall would be my least favorite choice here because while it hits planeswalkers it only destroys and much of the meta seems to involve indestructible stuff. Exilers are usually better. But when your destroy effect may cost a single mana, it wins the bet. Champion of Stray Souls is the backup plan if Rescue from the Underworld fizzles for whatever reason. You could also bring in Banishing Light or other white cards if you want to increase white's utility in the deck. Nyx Weaver is your Standard based "fixed" Eternal Witness. 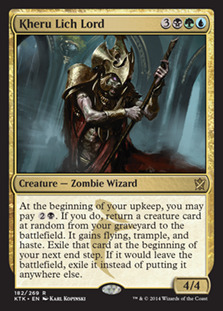 With it in play you can block something huge and pay to exile it and grab back anything that is in your graveyard. You can do this in response to other effects if need be. Sure it lacks recursiveness of the earlier shaman but on the plus side it stands up quite strongly to early aggression without dying and can be a pounder itself if need be. To Give you have to Get...or wait..
To get you have to give, yeah that's the ticket. This next list is about sacrificing stuff to get stuff. Wall of Mulch and Gift of Immortality are the combo pieces in conjunction with Abzan Ascendancy. Sure sure everyone loves Jeskai but Abzan's ability set is pretty cool too. Particularly in regards to recursion. I was initially inspired to make this deck while brewing other decks and play testing them in Just For Fun. Another player brought a deck featuring the combo and while his deck did not fare well against mine in the end, it held off my game for a long time. In fact I stopped brewing the deck I was working on to work on this. Unfortunately as I am easily sidetracked by ideas I did not complete it until a few weeks ago. Once again, Fated Return has a 1 off spot because instant speed never dies again guy is usually good enough for a "GG". But since it costs it can't come up too often. The combo is very simple. Play early walls, stop the aggression (since that is your likely worst problem.) Then slip a Gift of Immortality on it. After that you can get an Ascendancy or Spirt Bonds out and start making tokens. A Gift on a Rhino is some good as well since you can sac that to Jalira, readily enough. Sadly for our purposes, Caryatid doesn't count as a Wall but it is superior as a mana producer in this 4 color deck so it remains. The removal suite is pretty obvious though there are certainly many alternatives. Banishing Light is a good, relatively cheap removal effect of anything that is bothering your deck. Utter End might be better in a match up against Naturalize and the like. Dictate of Erebos is an instant speed grave pact and as such is often enough to clear the board when blocking. This deck is complicated and presents some difficult puzzles to solve but when it works it is totally euphoric, making you feel great. I highly recommend it if you like complex interactions. Did you say Recursive Turtles?? Why yes I did. In fact this next deck took me quite a while to brew because the idea percolated slowly from the first time I saw its key cards together. It is a cool interaction but considering how bad a reputation at least one of the cards has it should be a relative surprise to your opponent. The deck idea revolves around a simple yet unintuitive principle of Magic. When something is moved to the Exiled area, that is where all clauses forcing it to be there end. Those forces do not care if that item is brought back later or even instantaneously by another effect. This means that exiling Obzedat, Ghost Council and then having it return on your next upkeep after returning it to play with a Whip of Erebos is perfectly legal. It also means that Restoration Angel resets the exile at the end of turn status of anything brought back with Whip. 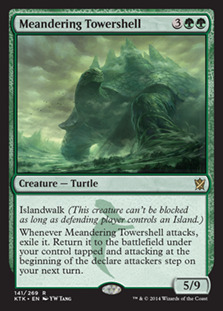 And since Kheru Lich Lord has a similar clause, Meandering Towershell fits neatly into such a deck. Recently I tweaked the deck a bit after having a long bad run with it. Adding in a Scorpion and Reaper gave the deck some much needed defense when Chording or using the Bard, and I took out the cute but useless 0/4 outlasting Disowned Ancestor because while it is quick and can quietly build up strength against a control opponent it does nothing good against aggro that pumps up past 0/4. And since Aggro is still King on MTGO, my build bows to the necessary evil of adding in cards to deal with it. As the nights get colder and we hug our loved ones closer (perhaps ignoring cries of protest and "phew, you need a bath!") we strive to be grateful for the life we live and despite hardships we may endure during this dark time we can take joy in our game/hobby, our inspirations and our fellow players. We don't need worry about the bigger things that threaten the world. Just focus on getting through each day without adding to its woes and hopefully bringing Weal to those around us. This isn't about being "Polyanna" or wearing rose colored glasses but making the most of what we got. If we don't spend our time complaining about what we don't have, and instead experience actual gratitude for what we do, we will get through the winter doldrums much easier. So it is in our best interests to smile (because that releases good feeling chemicals to the brain or so I am told), sing songs (again with the endorphins), celebrate our religions or non-religions as the case may be, gather family close and make contact with old friends. The client, V4 is not how many of us want it. But it is moving in that direction. I think. People who have quit for now will likely return eventually. Leagues will be arriving later but not never I hope. For now we have VMA drafts to look forward to, and Holiday celebrations commencing. The market is suffering through low prices right now which means the time is right for buying if you have the resources. Don't forget to get your power if you can. And as you encounter the deepest saddest parts of the sunless time, tread lightly with as much joy in your heart as you can muster. Paul Emerson Leicht, Winter.Wolf & Telir on MTGO. Awesome article Paul as we all expect by now. Thanks for taking the time to accredit me with the decklist idea, much appreciated! Just for clarity, I make no claim to be the first person to try this formatting- I believe a similar style is popular with a handful of writers on the biggest content producing sites. Nevertheless, it's a great feeling to potentially have contributed to a future of better content formatting for PureMTGO.com, even though you, of course, deserve all the real credit. Love the code by the way! I'll most certainly look into using it for my next article. Lovely stuff. Towershell Lich amuses me and makes me wonder what other self-exilers can be abused. Isn't there a frog that self-exiles? Anurid Brushhpper (One h or two? can't remember.) There's a white wurm from future sight, Saltskitter, and Norin the Wary. Back from the dead to run away again! Crystal Golem end step phases, I'd need to test that. You're implying insults all around, and borrowing other peoples problems. You're certainly welcome to your opinion but how are you feeling insulted by what I wrote? That isn't terribly clear. But to be clearer myself in case there is some misunderstanding I don't think anyone who uses 4chan, Reddit and the like are necessarily moldy, or misogynists or whatever other brush they may be painted with, despite what their image as sites may be. I do think they come off that way to the public and that is what I was pointing out. Meaning that identifying with known crows may make you seem like a crow. (Aesop's fable reference.) And the point I was making is not conflicting with my final statement in the verse you quoted. Don't believe the hype, don't be the hype. Live and let live. And don't be part of the hysteria. Hope that clears up any misunderstandings you may have with my text and that you don't have any hurt feelings over any of it. You are certainly a welcome contributor to this community and site and while we may not see eye to eye over the magic field I do respect your play ability. Also never apologize for calling someone out. It waters down the impact or seems ironic. Paul: as for your Vitamin D deficiency: Mushrooms when put into the sun (UV light) for an hour will naturally make Vitamin D.